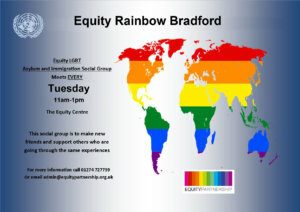 Working with and for Bradford’s Lesbian, Gay, Bisexual & Trans communities. Meets Every Tuesday, 11 am – 1 pm in the Equity Centre. This asylum and immigration social group is to make new friends and to support others who are going through the same experiences. For more information, call 01274 727759. SOUND is a group for LGB&T and questioning young people that offers a safe, confidential and supportive space in the Equity Centre. Sign up to our newsletter and keep up-to-date with the Equity Partnership. Copyright Bradford Equity Partnership 2015. Designed and maintained by our design works.